Escrima stick bags come in really handy for carrying your weapons on the way to your kali eskrima class. Back in Chicago, the whole city uses public transportation. You can imagine the crazy looks you get when you board an "El train" with Filipino Martial Arts weapons. Conceal your martial arts weapons neatly in these over-the-shoulder escrima stick bags and save yourself the hassle and the stares. 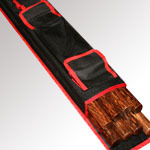 This large stick bag will hold 6 - 8 escrima sticks. It has three pockets for training daggers or other equipment. The shoulder strap allows you to keep your hands free and look stylish. Bags will accommodate sticks of ~28 inches. 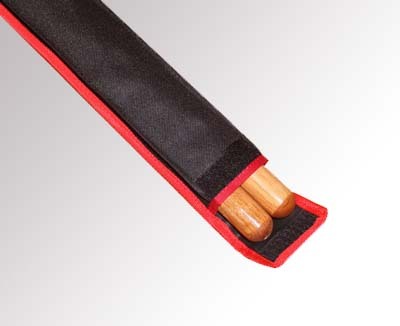 This small stick bag will hold about 2 escrima sticks. 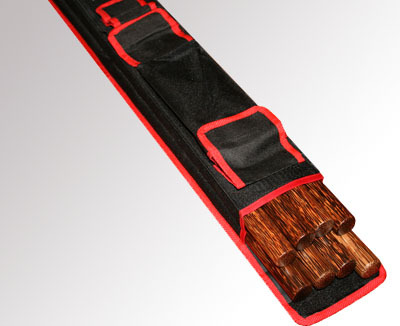 The shoulder strap allows you to carry your equipment to class comfortably and securely. Bags will accommodate sticks of ~28 inches.